Whether you just tied the knot, can’t find anyone to hand your old dress down to, are experiencing a divorce or just ready to destroy something beautiful, Trash the Dress is the new thing. 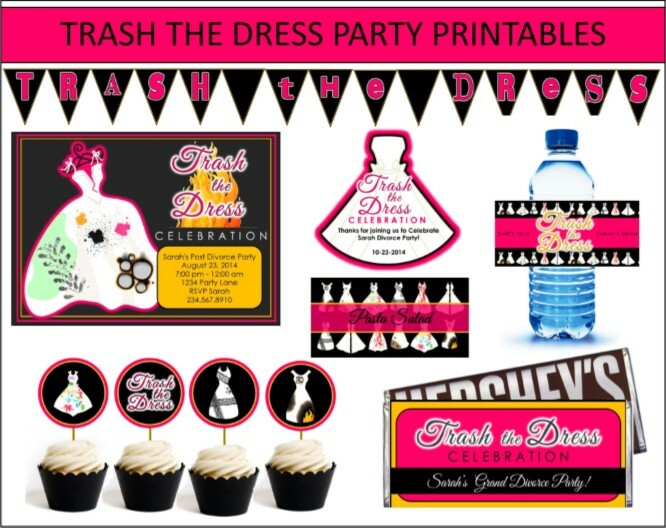 With the many ideas we concocted below and the awesome party printable’s we have designed for you, all you need to supply is your dress and some friends to celebrate with. So if you are celebrating your new found freedom or simply setting up for the all popular Trash the Dress photo shoot, you now have a reason to throw one heck of a party while you are at it! Download our printable trash the dress party supplies. Use adobe reader to insert your own detail, print, invite your girls to join the fun, and Voila! You are ready to get down with your gown! · Take a spin in your dress while you are out on the four-wheeler, spinning tires through the mud and muck will help you to mess your dress really good. · Rolling around in the mud while in your dress or mud wrestling with a couple of friends can make for great photos and endless laughs. · Lay your dress on the muddy ground. Put on some old boots, have friends join if you please, and stomp on that dress still it’s one muddy mess! · A trip to the beach is a great way to drown your gown. You can roll around in the sand, build sand castles or depending on the weight of your dress, just go for a swim to mess it up a bit. · Venturing down to the lake or river in your dress to go fishing, canoeing or hiking will get you more than a couple of sideways glances. In this case, making a scene and trashing your dress go hand in hand. · Playing in the rain is not just for kids anymore. Trash the dress while jumping in puddles, dancing in the rain or use the opportunity for some awesome photos of you with your rain boots on, struttin' your stuff. · Get your besties together to have a good water balloon fight. Only, this time, you are going to put colored water in the balloons. Start by putting a drop of food coloring inside of each balloon before adding the water. Fill the balloons with water and set aside. Use several colors to create a nice array of colors on your dress. · Graffiti is an art form that can color your city walls and help Trash the Dress. You can lay your dress out and tag it up with cans of spray paint or you can wear it and have friends tag you. Feel free to invite your friends to put one word comments on how they feel about you as a person. Once the dress is dry you can store it as a keepsake. · If painting is more your forte, then this is a great way to dye your duds. Have several colors available in either wet paints or color powder, if you want a dry session. Have your friends line up on both sides of you and as you run down the line, they can throw the paint on your dress. You can even participate in a game of paintball to get that dress looking a mess. · Use a seam ripper to take the dress apart and create new items with the pieces. Depending on the materials used in your dress you can make doilies, mini purses, aprons, or anything that comes to mind. This is a great reason to have friends over to celebrate your Trash the Dress event. · Take a pair of scissors or several pairs if you have some assistance available, and cut it up into pieces. You could even put the pieces into a jar/urn with a note to remind you of why you chose to shred the threads. · Cut your dress in half and his tux or suit in half. Sew each half of the other to one another and now you have created two awesome costumes to wear, sell or keep for a good laugh. · If your aim is to celebrate your Trash the dress in a big way, why not make the dress the center of it all. Put that dress on and go out for a night with the girls. If you party like a rock star your dress won’t survive the night in one piece. · If you have a willing opponent or opponents, you can use your dress as your getup for a Jello wrestling event. You could even do this as a large group event and gather other people who want to rock their frock and Jello wrestle one another as a way to destroy the dresses as one. · You could also put your dress on an inflatable doll and bring her out with you. Let the party goers take turns taking pictures and helping you to disfigure the dress throughout the night. · If you like to make a mess, then do it in your dress. Start a food fight with your friends. Use anything from pudding and pies to pastas and pizza. 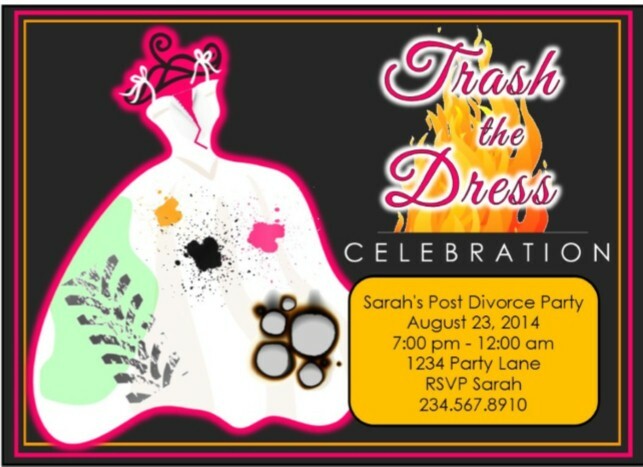 You can all feast and use the leftovers for the fight or set up with the idea of Trash the Dress as your main objective. Either way its fantastically filthy. · Have your friends make their best version of a wedding cake and take turns smashing them on your dress or while in your dress. You could even hold a contest for best cake and use the other cakes for smashing and trashing your dress. · You can use your Trash the Dress as an opportunity to host a wine tasting. Get a small inflatable pool and fill it with red grapes. Have everyone remove their shoes and give them a glass of wine. Lay your dress atop the grapes and have everyone takes turn stomping your dress into the grapes. · If you like the idea of burning your dress as a way to leave the past in the past then barrel burning is a great method. Place the dress and any items that remind you of the past into the barrel. Set it on fire and watch the past go up in flames. · You can host a bonfire and invite your closest friends over for a marshmallow roast. Enjoy some s’mores while you talk about what your fondest memories are from times together over the years. · You can create your own burning man event and take the dress out to the desert with you. Stuff it like your would a scarecrow and stand it up. Set it on fire from the bottom, stand back and watch it burn. · Wear your dress during a snow ball fight and get a dirty as possible. Make some snow angels in the yard and don’t forget to take pictures to capture the moment. · If you are one of the many adults that love the movie Frozen, this is a good way to Trash the Dress. You will need plenty of glitter and spray glue. This is like a diva version of tar and feathering. Put on your dress and spray the bottom of the dress with the glue. You can allow your friends to throw handfuls of glitter onto your dress or you can roll through glitter laid out on a plastic table cover. Either way, you will look like you crawled out of a scene from the movie Frozen. Now step out into the snow and snap some pictures. · Go ice skating, play ice hockey or try skiing in your dress. After a couple of spills your dress and possibly you, will be done for. 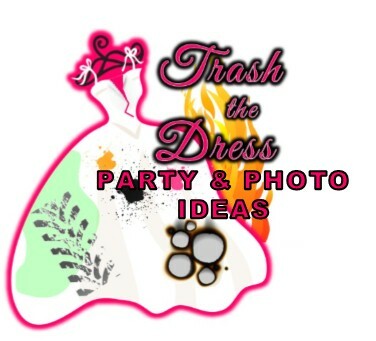 · If you are choosing to do your Trash the Dress around Halloween then you have opened up a few neat opportunities. You can start using your dress as a starting point for a good costume. Stitch a couple of fake bloody parts to the dress and go as a bride butcher, collector of hearts. · Zombies are a big deal, so use your dress and become a zombie bride. You can host a Walking Dead/Trash the Dress party and destroy the dress with fake blood, tears, and lots of gore, just don’t forget to have fun. · You can also do a play on movies turn your dress into a Corpse Bride ensemble. If you feel the fire and rage you can use the movie Carrie as a reason to douse your dress in fake blood and secure that the dress is destroyed. · Going mudding, as a passenger, with the windows down while holding a glass of something that stains easily (Kool-Aid, grape juice, big red) should give you a good staining. You can even stand around while others are mudding and catch the back splash to get a nice coat of mud on your dress. · Take a ride on some of the farm equipment; getting some of grease from the machinery will help Trash the Dress really well. · Most country girls don’t mind getting down and dirty, so why not do it in your dress. You can climb a tree, race your friends by rolling down a grassy hill, roll around in the hay, ride horses or try chasing some pigs and chickens to get nice and messy. Download Your Printable Trash the Dress Supplies Here!